Who doesn’t dream of making money online these days? Guess what – it isn’t impossible. You can do it blogging — I am — and there are all kinds of directions you can take that. A blogging career can seem like either an impossible journey or a plunge into the unknown. After all, of the millions of blogs that are started each year only a very few ever make any money and last as long as a year. I’m of the opinion that having a workable strategy can stack the blogging deck in your favor — not just a little, but substantially. Like any other money making venture, blogging can actually be done in steps, and as you master one, you’ll be well-prepared for the next. I’ve identified at least three — complete each and you’ll have built your own online business! You can earn money immediately, usually within 30-60 days of starting. You can earn money while you’re waiting for your own blog to get out of the “sandbox” — more on that in the next section. There’s a saying on the web, “content is king”, and when you write for other sites you’re learning to create that content; if you can master this, you’ll have a future in blogging. The market for content writers is virtually unlimited. While you’re writing articles for others, you’re also building a topic inventory that you can eventually use on your own site. Freelancing can give you an additional revenue stream, which is a form of income diversification, an important concept especially for a beginning blogger. It’s “earn-and-learn” — you’re making money while learning the business. Number one on the list is one we should spend some time on. Blogging (for income) is a painfully slow process — it can take months to make a little and years to make a lot. Its human nature that we’re likely to give up on a venture that doesn’t produce at least some sort of positive results; freelance blog writing can give you those results early. The online universe can be a scary place for the beginner, but bringing in even a small income early — just a few hundred a month — can be enough to whet your appetite for more. Make a little bit of money on the web, and you’ll not only realize that it’s doable, but you’ll also begin to see the potential for more — a lot more. Put that concept to work for yourself — freelance blog writing is the place to do it. In addition, by writing for established sites, you’ll have a ready source of all-important back-links to your own site if you have one, or if you plan on starting one. Back-links from strong sites to your own is one of the best ways to build both site traffic and credibility. And most sites that you write for will allow you to have a back-link to your own site with each post you write usually in the “bio” at the end of the article. If you want more information on freelance blog writing, check out my post, The Perfect Side Hustle: Freelance Blog Writer. This is something I’ve been doing for a few years and I continue to do even now – in fact, more than ever. This is where the vast majority of would-be bloggers get their start, and that included me. We have “something to say” and that’s the motivation to start a blog. We‘re also pretty sure people will somehow pay us to give our opinions. While that may be true, it’s equally true that it will take time before it happens — exactly how long is an open question. The problem with that is arrangement is two-fold, 1) we can’t be certain how long it will take, and 2) there’s a real possibility it will never happen. OUCH! – but that’s the ugly truth. But if you start with Step One, freelance blog writing, you’ll have that developing and growing while your own blog is “maturing”, so to speak. You’ll not only know what kind of content sells on the web, but you’ll also have “found your voice”—a process that only comes with blog writing experience. The “sandbox”. Remember I mentioned this in the last section (item 2)? “Sandbox” is a term that’s used to describe what happens with new websites — before they get noticed by the search engines, they go through a period of, well, being ignored. I’ve heard it said that they do this precisely because most sites don’t last more than a few months before they’re abandoned by their owners. This doesn’t mean that you put up a blog, leave it dormant, then start posting once you’re out of the sandbox. You’ll need to add content regularly during that time, even though not much will be happening. Figure on at least six months in this position when you first start your blog. If you’re freelance blog writing while your site is sitting in the sandbox, you’ll be sharpening your skills as a content writer, building up an inventory of content ideas for your own site, establishing a “fan base”, and—very important—building back-links to your own site from the ones you’re writing for. All of this will enable your site to come out of the sandbox quicker and stronger. That’s why you want to be writing for other sites before or at least during the start up phase of your own blog. By doing Step One first, you pave the way for Step Two—the start up of your own blog is that much easier. Once your site has a page rank and is getting at least a couple thousand visits per month you’ll know you’re out of the sandbox and in a position to start gradually monetizing the site. Once you learn how to successfully operate your own blog — writing winning content, marketing your posts and your site, and monetizing it through advertising and affiliate arrangements — you’ll be ready to move up to the next step, the one where earning real money in blogging starts to become possible. And because you’ve taken Steps One and Two, it’ll be less of a hurdle and more of a natural progression. This is really Blogging2.0 — instead of having one money making blog, you have several. Once you have two or three money making sites, you’re no longer a blogger, you’re a blog entrepreneur. You’re leveraging your success on one blog into many, and it’s easy to see where this can lead. 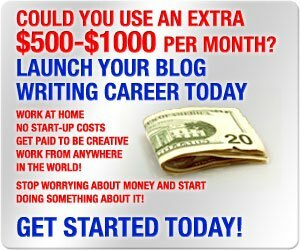 If you have one blog making $1,000 a month, having ten can mean $10,000 a month. And if you already have one successful site, adding more periodically won’t be as daunting. There are two ways to do this, either starting brand new sites (little monetary investment, but takes much longer) or buying existing sites (much quicker, but requires an upfront investment). Which is better? I’ve read the arguments on both sides, and can see the merit in each. If you want to make money blogging but haven’t done it before, don’t take a plunge — take it in steps. Freelance blog writing will set you up for having a successful blog, and having one successful blog will prepare you to have many — and the income it will bring. And one step at a time can get you there. 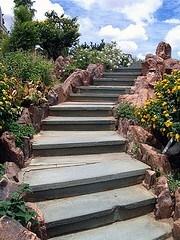 Do you think that taking blogging in steps might make the path to success easier? Or even raise the chances of your success? ← Should You Use Retirement Savings to Pay Off Debt? You are right in saying that first step to blogging is to write for other blogs. It has two advantages. One it create your name in blogosphere and second you get start earning some money that can take care of your blog’s expenditure. It can also act as test bed for blogging. GJ–Exactly, that’s why I think it’s THE place for a beginner to start. Even though you’re “just writing for other sites”, there’s a lot going on that compliments having a blog nicely. It enables you to build a foundation on so many fronts. And the money doesn’t hurt either! It’s that motivation thing, and you have to keep yourself motivated any time you try something new. Here is my question. How do you find the opportunities to write for other blogs? I’m willing, able, and have an area of expertise (giving and fundraising). I just don’t know where to find the opportunities. Thanks! Hi Drew–Rather than give you a long-winded recap here, I’ll refer you to my post The Perfert Side Hustle: Freelance Blog Writer. It goes deeper on freelancing, and there’s also an ebook available that goes into some detail on finding clients for your writing. One thing that holds back a lot of bloggers is writer’s block – “What should I write about!?!? !” The answer to that question is anything. There’s is no need to be very professional right from the start, you can always edit and add to blog posts you’ve already written, you can start new blogs too. It is a journey, even though for many its quite boring at times. Hi Dan–That can be an issue for established bloggers too! But I agree, you can get a bit intimidated by the choices early on. I think it helps to be “out and about” around the blogging world–what are other blogs writing about, what’s trending in the news, what seems to interest people. I also find that writing one post often spins off other ideas. I can never fully cover a topic in one post, which sets up new ones. This is why I think freelance blog writing is good for beginners. It gets the creative juices going and once you have and inventory of dozens of posts you can usually find topic to write about pretty easily. YFS–Content, content, content! And a healthy use of the social media! IMB–It also requires building quality backlinks, and writing on other blogs is one of the best ways to do that. Plus you can get paid. If you know how to run a blog, you don’t need to freelance, but I’m directing the point to the beginner. Hi Kevin, For me, where most fall down is in the planning piece. It’s one thing to want to do it, It’s another to go make it happen. Hi Niall–I completely agree, though I’m not at all sure that blogging is so much directed by planning as much as contructive response and adjustment! I think the key is forward motion–make sure you’re moving forward no matter what, whether it’s freelancing, running your own blog, or running several. The blogosphere is an ever changing environment so adaptability is critical. That’s where the “making it happen” part comes in. Thanks for a great article. 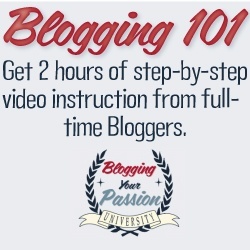 I agree that the Blogging Your Passion courses are great. I also love your description of the “sandbox.” It’s true that, while your blog is in the sandbox, you could be developing your writing skills and building your fanbase through writing for others. Have a great day! Hi Stacey–The course will help you to do blogging right, and from the beginning where it really counts. It will save a lot of time, and is well worth the money paid for it. I am blogging for personal purposes. I enjoy doing it because I feel I have a knack to be a good writer. Using it as a career or business where I can earn on the side is something I haven’t really considered — until I read your article. Thanks so much for the valuable ideas. I’m sure they will help me a lot. Keep at it Kristine! One of the benefits of blogging is that it can lead to good places in different directions. I feel that freelance writing jobs are a lot easier to get once you already have an established blog that a company can look at to get a feel for your writing. Hi Stefanie – That MAY be true, but I think you can do it just as easily by leaving intelligent comments on blogs that you follow, and doing some free guest posts. Once you have posts published on several sites, you have a portfolio. I do think a blog of your own helps too, even after you get started. Another informing, empowering, effective article.